Staying healthy and motivating others to become healthier through plant-strong food and healthy lifestyle choices. Easy baked potatoes, every time! KAREN’S HEALTHY DRESSINGS, SPREADS, SAUCES, HUMMUS, ETC. This pasta dish is so quick to make, you’re going to love it! And it’s soooo delicious … it’s going to be a favorite at your house!. It makes a great dish for a potluck too! I promise. You won’t have any left overs to take home …. Cook your pasta according to package directions. Prepare chopped vegetables. Heat a large skillet over medium heat. Saute the garlic and the onion in vegetable broth (or juice from your diced tomatoes). Stir in the green peppers for about 1 minute before adding the sliced mushrooms, zucchini and yellow squash. Cook for about 7 – 10 minutes. Add the sauce, tomatoes, pepper flakes and nutritional yeast. Simmer for 20 minutes to blend the flavors nicely. While sauce is simmering, drain pasta and add back to pot. When sauce is done, pour onto pasta, and heat slightly, serve immediately. 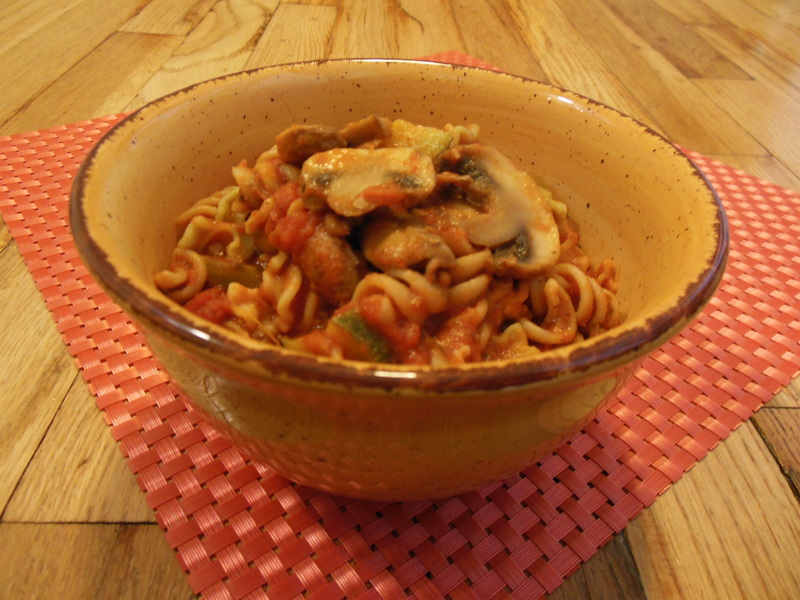 If you have leftovers, it will only taste better the next day … as the pasta absorbs the flavors nicely. While your sauce is simmering, put together a crunchy green salad and you will be enjoying a wonderful meal. I'm not a physician, or a registered dietitian or a licensed nutritionist. I'm a real person who took control over her life by making lifestyle changes. In that journey, I'm educating myself. My goal is to stay healthy and to share the information I learn with others who also want to make healthy lifestyle changes.